African children develop aesthetic sensibilities at an early age, roughly from four to fourteen years. By the time they become full-fledged adolescents they may have had up to ten years experience with various art forms--masking, music, costuming, dancing, and performance. Aesthetic learning is vital to their maturation. 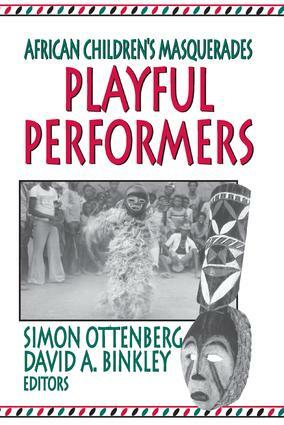 The contributors to this volume argue that the idea that learning the aesthetics of a culture only occurs after maturity is false, as is the idea that children wearing masks is only play, and is not to be taken seriously.Playful Performers is a study of children's masquerades in Africa. The contributors describe specific cases of young children's masking in the areas of west, central, and southern Africa, which also happen to be the major areas of adult masquerading. The volume reveals the considerable creativity and ingenuity that children exhibit in preparing costumes, masks and musical instruments, and in playing music, dancing, singing, and acting. The book includes over 50 pages of black and white photographs, which illustrate and elaborate upon the authors' main points. The editors describe general categories of children's masquerades. In each of the three masking categories children's relationships to their parents and other adults differ, from a close relationship to some independence to almost complete independence. No other major work has covered this aspect of African children at this age level. The book offers a challenging perspective on young children, seeing them as active agents in their own culture rather than passive recipients of culture as taught by parents and other elders. It will be interesting reading for anthropologists, art historians, educators, and African studies specialists alike.